Music Begins to Inspire Our Art. Those are the words I passionately said to fifteen spellbound children, sitting around my record player and watching me carefully take an album out of the jacket. I put it onto the turn table and lowered the arm. I knew that this was true, and that the children would become masters at their work when listening to music. Their fingers could paint what was in their heart. Then I began to play the music, Beethoven Symphony No. 9. This music starts low and builds to a crescendo. The louder the music, the bigger and wider children’s eyes became. We listened. We heard the sounds of violins. At the same time I showed children works of art. They liked “Gladiolas” by Claude Monet, among many others. I should have known better than to ask if anyone was ready to listen to Beethoven and paint. The stampede was predictable. Jayden was one of the first to paint. This day was his second time working on his art piece. Unlike Alex who is painting “The Yeller Who Got Lost”- his rendition of “The Scream”- Jayden wanted to create his own work of art. The first time at his piece, he was fascinated by using the paints, and carefully worked his brush with mostly white surrounded by black. It was a square, rather small and intriguing. He was quite satisfied. Now he was listening to music and working on his piece the second time. It was as if the math and science part of his brain had discovered the creative part of the brain. The seed that worked hard to grow roots was now germinating. Jayden returned to his art yet again, a third time. An artist knows when the work is complete. When he was finished he smiled. I stepped back holding the art to show Jayden his painting from a distance. “This is how people will see this at a museum or Art Show.” He nodded, smiled a big smile, and then he was off to play. These masterpieces will be mounted and framed. Children will give their art a title. All masterpieces have a title. I wonder what Jayden will name this gorgeous painting. Lucca had listened carefully when I told children the titles of different masterpieces. After three visits to paint her art, she proudly told me the name. “Falling Tree.” I hadn’t even asked! She pointed out the tree, earth, and sky. Beautiful! This entry was posted in art, Early Education, Inspiration, music, Teaching young children, The Arts, wonder and tagged art, classical music, Early Education, learning through music, music, music inspires art, painting to music, teaching young children, the power of music. Bookmark the permalink. 103 Responses to Music Begins to Inspire Our Art. What a wonderful way to inspire art. I used to use Pictures at an Exhibition by Mussorgsky for the same purpose. I love Jayden and Lucca’s paintings. Awesome lesson plan. I like using the senses to stir creativity. That second painting is impressive! He or she saw a story. I love listening to the stories in music. Thank you, Cindy. Using the senses along with real tools really stirs creativity. The record player adds another layer to stimulate creativity. I’m so glad you liked the second painting. I was blown away. Lucca and Jayden art work is so creative and they are budding artists. Jennie, what an awesome lesson of creativity for both of them! Wonderful! Yes. That really is amazing. These are truly inspired pieces Jennie! Art and music just naturally compliment one another! Lovely artwork! The music sure sparked something. Most definitely. When music and art are combined, even Mother Nature smiles. 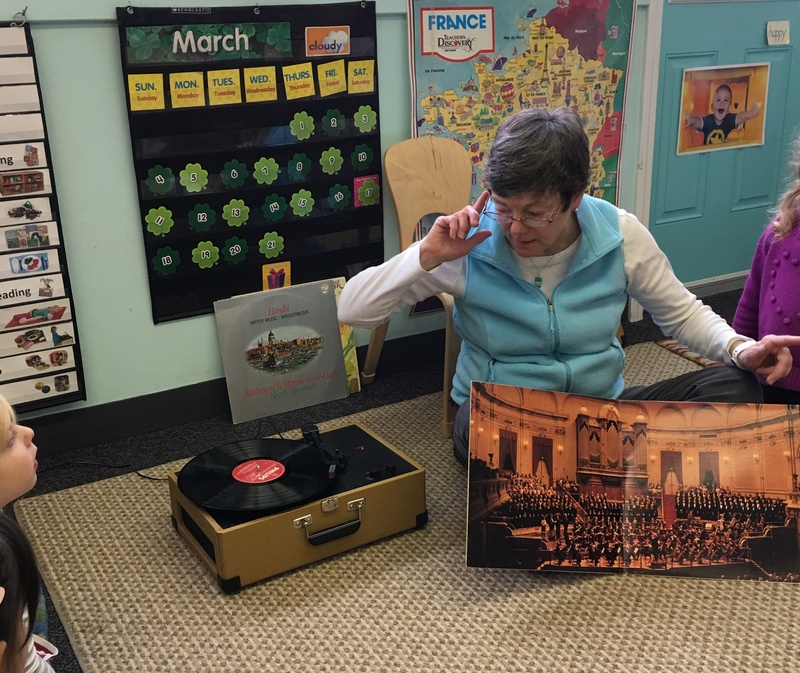 Your record player is exactly like the one my wonderful grade three teacher brought to school to play the Grand Cayon Suite and other amazing music for us to listen to all those years ago. I can just feel the excitement in the children as they work on their masterpieces. This was in my spam folder, Darlene. I certainly remember reading it and delighting in Grand Canyon Suite. Thank you! Thank you, Diana. When it’s all connected, the best happens for children. If I encourage the arts, all children feel it. I do, too. It really is magical. Really. It feels like a state of being that is somehow not part of here and now. The children totally get this. They’re the first ones to jump right in. Wonderful! Their minds are so open. They haven’t started compartmentalizing to the extent that adults do. No rigid borders. 🙂 Yay. How about you? Do you get to pick up a brush and whisk colors on paper while listening to your phono-playlist? Oh Jennie, this is amazing! 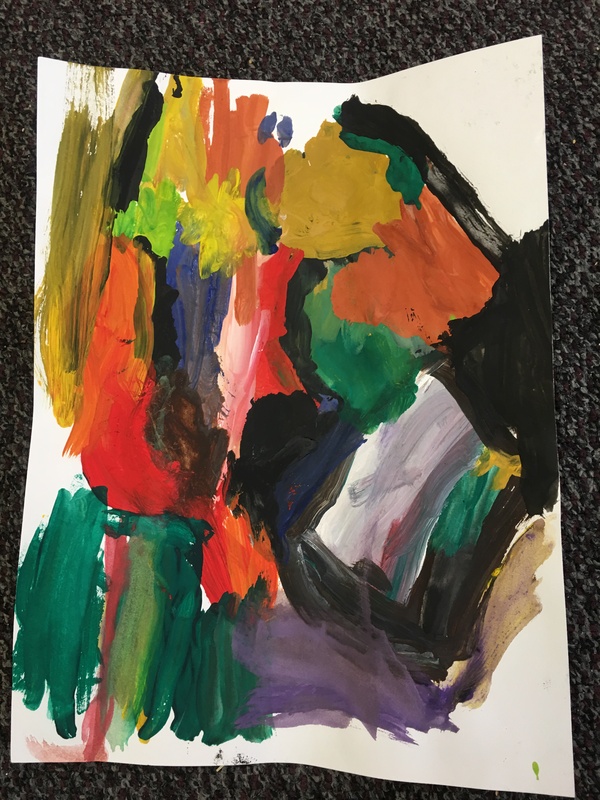 Jayden’s painting is beautiful – what a good photo of him in action. 🙂 All masterpieces have titles, indeed. Funny to read this post, as I was just thinking about offering a half-day workshop on creativity and forgiveness, e.g., by renting an art studio and doing a forgiveness process that involves painting. Anyway, I’m playing with it, and I’m completely inspired to see what you’re doing with your kids. What a great idea, Jennie. Music helps us relate to many things. I love the paining. You do such a good job with these children. Thank you for your kind words, Dan. Music really leaves an impression on all of us. It triggers the brain and emotions. No wonder it works miracles with art. I am in awe at the children’s paintings. You are a treasure, giving this gift to children who will carry it throughout their lives and many will pass it on. I loved the last painting most of all. It seems as if it belonged in the Master’s garden in Giverny. It does remind me of the time I spent there. How fortunate they are to have such a teacher. Thank you for your kind words, Lea. I see the last painting the same way, too. 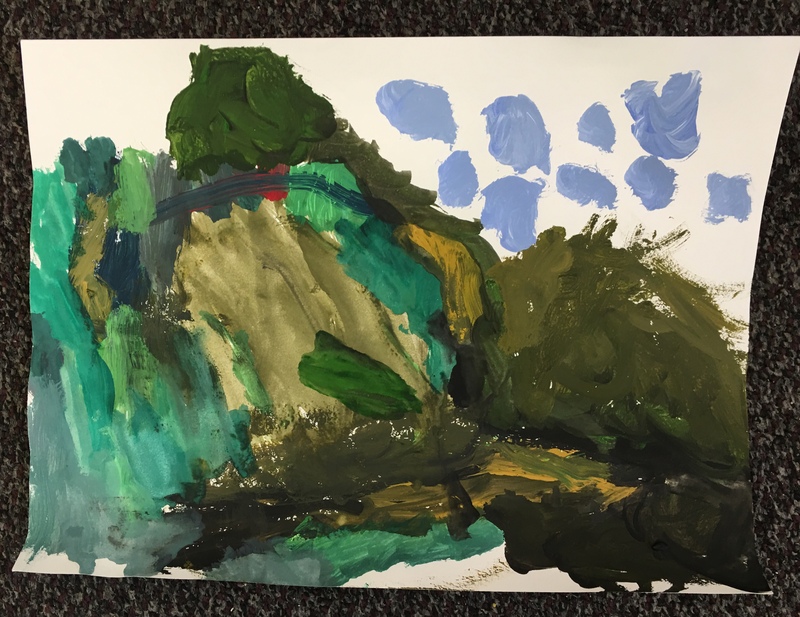 This work by your children is wonderful, Jennie, and I very much enjoyed reading your post about their process as much as seeing their product. The words you used to introduce the lesson are inspiring. I’m not surprised you got such beautiful results. Thank you, Norah. If a teacher is excited the children will be, too. You should see me saying those words to children. It’s as if I had just found gold. Adding the “real” components of artist paints and the record player makes all the difference. Today Pointillism. We’ll see how that goes. I can just imagine you saying those words to the children. So much magic in them. You are such a creative teacher. Many thanks, Norah. One of my Peter Pan moments. Lucca’s painting shows real potential. Not only has she got the whole scene, she has imagined what caused it to happen with the falling tree, and named it too. Inspiring stuff! I definitely agree. Pretty amazing for a four year old. And, she is very proud of her art piece. Thank you, Pete. Best to you. 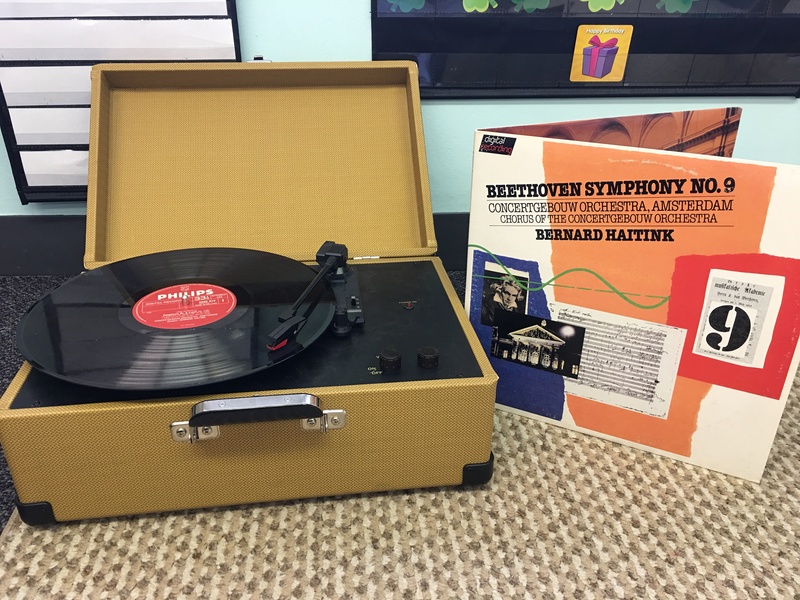 There is nothing like classical music on vinyl to get the creative juices flowing!! Music is wonderful for inspiring all the other senses. Visions, smells, emotions, etc. Once you allow it to enter – a whole new world opens up! Well said, GP. You are absolutely right. Thank you. Now you have me thinking of what they would do with other songs, such as Imagine? Or perhaps Ode to Joy? And just what they might create hearing the old Sounds of Silence? Magical! I stick to instrumental, because that allows the music to become the inspiration. If I included singing, then the music becomes a song, and that doesn’t do the same thing. Songs are restrictive or limiting for children. Now, for adults, it’s a different thing. Painting to Imagine would be heaven for us. Make sense? Thank you, Lea. You certainly are very good at bringing out the creative side in your children, Jennie. Nothing wrong with that, Jennie. Children are very creative and original until society and social pressure forces them to conform. Pablo Picasso said: Every child is an artist. The problem is how to remain an artist once we grow up. You said this beautifully, Dayne. Very true. Picasso understood, too. Thank you! This is very good read. I was also working on memorization using the music. Thanks for encouraging us! This is a wonderful post, Jennie. I loved seeing the children’s paintings. You spoke what I used to try to communicate about my music. Although I don’t play anymore (thin walls and I don’t want my neighbors to hear me), what you said (except the magic part) is how I described it when people asked how I could play. I play piano by ear — or at least I play *with* it. You are spot-on. Hugs. Both of these paintings are gorgeous, wow! And I love the idea of Monet maybe listening to the same music. I’m always thinking things like that—the overlap between days gone by and today. Thank you, Marcia. We have even more “wow” paintings, thanks to music and real tools. It really is cool to think that Monet probably listened to the same music. Yes, today and yesterday are much the same. Thank you, those paintings are wonderful. I see the falling tree and am amazed at this painting of Lucca’s. I think so, too. I just hung the entire Art Show yesterday. Wait till you see these framed masterpieces! We walk the children to see it tomorrow morning. Stay tuned for a post with photos!! 🙂 Happy Sunday, Robin. I am impressed by the art. Such a wonderful way to engage kids and connect them deeply to great music. I’m a firm “Arts for Everyone” believer, and you are doing tremendous work to keep music accessible even for the “least of these.” Great work! Thank you so much. Your kind words are appreciated. Children learn far more through the arts than other subjects. That learning is as meaningful for their minds as it is for their souls. Win-win. Thank you! And, a great question. I think music triggers the emotions and the heart. That in itself is the groundwork for developing kindness, understanding, and all those important life skills. I doubt that troubled kids had that experience. Know what I mean? Also, listening to music, the sounds of the instruments takes focus, and kids need focus! Playing the instruments takes patience and persistence, and that is also something kids definitely need. Does this help? Yes it does! I love your view on this. Thank you very much! This is fantastic! I love that you are demonstrating to the kids how the different arts can compliment and influence. A poem with music becomes a song. Music with images becomes a movie. The more layers, the better. Thank you, Angela! I love what you said, how art complements and influences many things, from poetry to movies. Your words are beautifully written and ring true. Thank you! Absolutely, this is an inspiring post and I enjoyed it very much. Thanks! You are welcome, Angela. And thank you!